Frette bed sheets have been a staple at luxury hotels in the United States and Europe, on cruise ships and have graced the homes of wealthy, aristocratic families since the Italian company was founded in 1860. If you don't mind paying a little more for luxury, you can have these high quality linens in your home as well. Frette sheets are made with the finest Egyptian cotton and superior craftsmanship. These luxury sheets don't come cheap, however, as prices range from $350 for a queen set to as much as $2750. For those who are unfamiliar with the Frette brand, these luxury sheets are made from fine Egyptian cotton and range from 200 to 300 thread count. The ever popular Hotel Charme collection sheets feature a classic jacquard stripe and have a silky, sateen finish. The Hotel Classic sheets are bordered with attractive double piping embroidery and feature classy monogramming on the pillowcases and flat sheet. 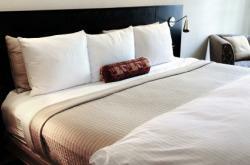 Bloomingdale's- Here you can find queen sized, Charme sheet sets, which can also be found in many five star hotels. In addition to the sheet sets, Bloomingdale's also has Charme duvet covers and European shams. Pioneer Linens- This retailer of fine designer linens offers the Frette Hotel Collection, which features double piping sheet sets in California king, standard king and queen sizes. Find duvet covers and European shams here also. Monogramming is available. Woods Fine Linens- For those living in the United Kingdom, this retailer offers several Frette collections including Doppio Ajour, Triplo Bourdon and the Classic Hotel Collection. Frette- Find the largest selection of this luxury, brand-name bedding straight from the source. On the Frette website, you can order bed sheets from all four Frette bedding collections, including Edmond Frette, Couture, Hotel and Essentials. Obviously, with high priced linens such as these, finding good deals is important to any buyer. One place you can look for great deals on Frette bed linens is eBay. eBay has a section dedicated to the Frette brand in their home living category. Many professional sellers on eBay have a business license and are able to buy brand-name merchandise in bulk. This enables those sellers to offer the merchandise significantly below normal retail prices. The competitive marketplace on eBay makes it a great place for buyers. Just be sure to check the seller's feedback and only buy from sellers with good reputations. Also, you can search online for sample sales, which often offer deep discounts. If you have ever had an experience sleeping in a room at a five star hotel or slumbering aboard a luxury cruise ship, you may remember the feeling you had sleeping between sheets of this quality. It may sound frivolous to some to spend hundreds or thousands on bed linens. However, for those who can afford them, a good night's sleep in ultimate comfort may be absolutely worth it.